The Evolutionary Studies Program at SUNY New Paltz invites all members of the community to the Ancestor’s Trail, a unique educational resource that uses GPS and an online guidebook to map virtual lineages of life onto real hiking trails in the Mohonk Preserve. The project is developed by a team of New Paltz students and faculty, with generous support provided by the Richard Dawkins Foundation for Reason & Science, an organization founded and chaired by perhaps the best-known evolutionary biologist since Charles Darwin. 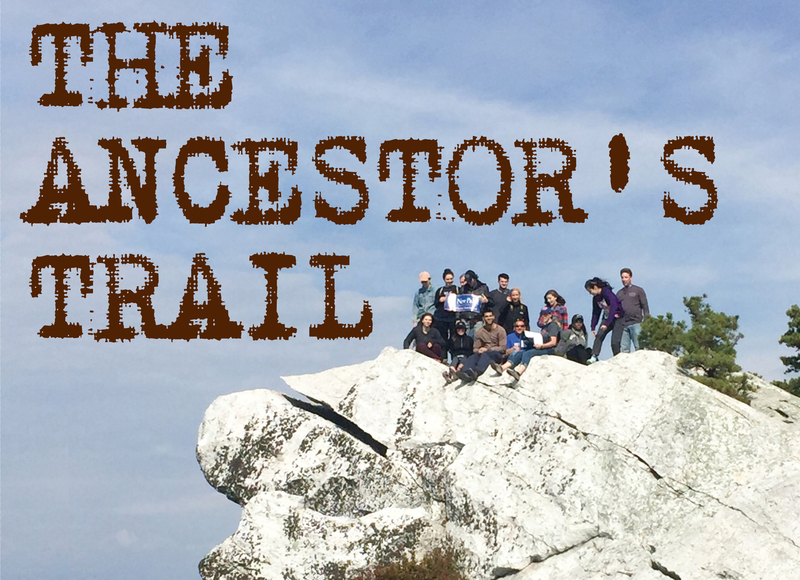 The Ancestor’s Trail will open at 9:30 a.m. on Saturday, April 28 at the Spring Farm Trailhead, with a celebration including music, Victorian costumes created by the Department of Theatre Arts, and student and faculty trail guides on hand to lead hikers through the history of evolution. General admission is $15, the standard admission cost for a Mohonk Preserve day pass, and SUNY New Paltz students will be admitted free. Learn more and preview the Ancestor’s Trail guidebook at http://evostudies.org/the-ancestors-trail-usa/. The Ancestor’s Trail team is led by Professor Glenn Geher, visiting research scholar Aron Wiegand, and graduate student Olivia Jewell ’18g (Psychology), who were inspired by a similar project developed in 2010 by the United Kingdom-based science educator Chris Jenord. They’ve worked for months to import Jenord’s concept – a virtual representation of evolutionary history that corresponds with a web of interconnected trails – to the Hudson Valley. “The project allows participants to get a sense of just what is meant by an ‘evolutionary timescale,’ with each step, depending on the particular path, scaled to represent thousands or even millions of years,” Geher added. The Ancestor’s Trail launch festivities kick-off on Friday, April 27, with a series of opening remarks made via Skype by evolutionary scholars from around the world. That event begins at 4:30 p.m. in the Coykendall Science Building, and moves to Bacchus restaurant in downtown New Paltz for a “Darwin’s Happy Hour” at 5:30 p.m. The Trail will open the following morning, Saturday, April 28, and will remain available to community members in the form of an extended guidebook and collection of maps, which can be accessed free of charge at http://evostudies.org/the-ancestors-trail-usa/. Contact Glenn Geher at (845) 257-3091 or geherg@newpaltz.edu for additional information.